With a twist of Gothic, Renaissance and the Romantic, Hieronymus van Aeken Bosch is a puzzling artist and unlike any other artist of his time. Of the many works he likely made in his lifetime, only forty works probably created by this master have survived to this day. His artistic training most likely began with his father's or grandfather's instruction. His grandfather, Jan van Aeken, was a notable fresco painter. From them, he would have learned and developed a way of creating spatial relationships within the painting, weaving a tapestry of deep images. This painted communication of ideas would influence the work that would be produced by the coming generations; not only in 1500’s Europe, but also with the more contemporary surrealists, like Salvador Dali. Boach is an above most people creating art during his time in terms of his originality and inventiveness. Through gargoyle like monsters, demons, and twisted human souls; Bosch communicates his deeply religious opinions about the problems of the human spirit at this time in history. In the years leading up to Martin Luther's famous posting of the Ninety-Fifth Theses, people were becoming more concerned with the abuses of power in the Roman Catholic Church. With high moral standards, Bosch believes that most are temped by the Devil. But he himself struggled with morality. He was torn between forbidden pleasures and the morals he has been instilled with. People at this time recognized the visual metaphors that many artists placed in their artworks. Borrowing symbols from witchcraft, madness, myth, and other sources, Bosch balanced on a fine line between the vulgar and the decent. One artwork that strongly dealt with the subject of morality was The Seven Deadly Sins and the Four Last Things, painted to a table top. The central inscription states "cave,cave, Dominus videt" ("beware, beware, the Lord sees"). Seven sins of daily life are enacted: Anger (men fighting drunk outside a bar); Pride (a woman admires herself in a mirror held by a demon); Lust (a couple looks outside their relationship for companionship); Sloth (a nun urges a sleeping munk to pray); Glottony (the over consumption of food and drink); Avarice (lawyers bribe the judge); Envy (a man wants anothers wife, another wants anothers money and a dog wants a bigger bone). The four outside circles show the Last Things: Death of Christians, Last Judgement, Hell and Heaven. 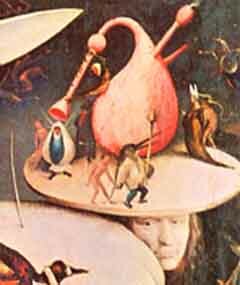 Another of Bosch's works that reflect his strong moral and religious belief is The Ship of Fools. 1480. Oil on panel. Museo del Prado, Madrid, Spain. Art at its core is about communicating ideas. The idea began with reading. As the story goes, Bosch read Sabastian Brant's satirical commentary about religion. In this allegorical poem, Brant describes 110 assorted acts of foolishness and vice. Each of these was illustrated with by a different fool. Chapters were devoted to such offenses as "Marrying for Money" or "Noise in Church". However, there were several chapters that were united by the common theme of a ship that was setting out on a journey to Narragonia. This was the paradise island of fools. It was a place of sloth, lust, gluttony and greed. Any imaginable pleasure was there; all without any required payment. But without a leader, as well as being a bunch of ignorant people, they never do reach the island. Unlike Noah's Ark that saved the faithful from danger, this boat sails the seas aimlessly and they all die. Bosch enjoys the covert criticism of the church, as it was symbolized by the ship. After reading this, Bosch was motivated to illustrate the satirical ideas of vice and attack a corrupt society. The writing was titled Das Narrenschiff, or The Ship of Fools. In Bosch's painting, The Ship of Fools, he illustrates his these people who are floating through life as idiots rather than working to improve the world, as well as their souls. All of the seven deadly sins are represented in this one painting. The central characters are the monk and the nun, who sing to one another as a symbol of their shared prohibited sensual love. This is also suggested by the cherries that are on the plate between them. What is the round thing hanging between them? A pancake. They are playing some sort of game eating this pancake. It was tradition to eat all the eggs and milk before lent, but they choose to consume these products with a wasteful luxury. Other people play various roles, like the man in the front (far right) of the boat who is puking over the side of the boat as he steers the ship to nowhere. The professional fool, with his donkey ears, sits in the tree as a symbol of a universal fool. In the water around the boat are swimmers that aspire to join the party and become fools themselves. Behind the nun we can see a pitcher upside down on a pole. This symbolizes consumption of alcohol (also seen in the in the stored barrels behind the monk). The mast trees are direct symbols of the tree of life. As our eye moves up from the lower tree to the top one, we first see a person reaching up to a chicken tied to the tree. This symbolizes the gluttony of the times (also seen in the spoon shaped oar). Then we notice the long banner flag with the crescent moon on it as a representation of Islam. Lastly, way in the top of the tree, we see the owl. Often seen as a symbol of wisdom, this owl comes to represent heresy. As a bird that hunts at night, it is a dark and spiritually unenlightened symbol that can also be linked other forms of evil and superstition. It is said that influential Christian leader Desiderius Erasmus was so moved by the painting, it inspired him to write The Praise of Folly in 1509. That writing began the Protestant Reformation. 1500. Oil on panel. Musee du Louvre, Paris, France. Bosch’s best known work is Garden of Earthly Delights. In 2010, I went to see this work at the Prado, and let me tell you, it is amazing. This three paneled work, known as a triptych, shows the Garden of Eden, orgiastic paradise and Hell all in one work. The work is about morality, temptation, and the punishment for sin. The joyless Adam and Eve advance into a utopia of animals and humans in harmony with the Fountain of Life in the backdrop. This was a warning of the consequences of the desires of the flesh and other sins of mankind. In the center panel, with an abundance of sin. The work represents the whole world, as syboolized by the certral water pool that branches off onto the four rivers of the then known world. This work incorporates most of the Gothic symbols for sin. The far right section is the punishments for sin. People engage in reckless abandon and carnal pleasure. Icebergs in a lake of fire, flames shoot from black ruins, men being fed to machines of torture. Many of these torture devices are the very things that provided them with Earthly pleasure (like the harp, drums, lute and other music instruments). Gamblers, alchemists and members of the clergy that have strayed from their vows are greatly targeted. The right Hell section of the work contains the most sophisticated and extravagant symbols, as well as piles of visual metaphors. Its this artwork's dream-like setting greatly influenced modern surrealists and how they communicated their ideas. (Triptych). 1510. Oil on wood. 7 feet 2½ inches x 12 feet 9 inches. Museo del Prado, Madrid, Spain. Most of Bosch‘s work is in the form of altarpieces that were commissioned by churches. He was a deeply religious man and attended church at the Brotherhood of Our Lady in Hertogenbosch for over thirty years. It is also claimed that he was a member of a secret religious sect called the Adamists, and that many of his depictions illustrate their beliefs. Many artists have been influenced by Bosch, even if most are ignorant to his story. This first great artist that was creatively inspired by Bosch was Pieter Bruegel the Elder, at the end of the Renaissance.